Did you know that by following a car maintenance schedule, you can avoid most breakdowns? It's true. Breaking down in the middle of nowhere is nearly every road tripper's greatest fear. But car parts don't just decide to blow up or break for no reason. Part failure is generally the result of months or years of stress. You'll probably find a decent car maintenance schedule in your glove compartment. Owners' manuals often provide guidelines for checking, adjusting, and replacing car parts. Of course, some manuals don't - and other manuals simply disappear over time. Tires. Tires often come with a mileage rating (for example, 50,000-mile warranty). But remember that this is just a suggestion. Depending on your driving conditions and habits, your tires may wear out much sooner or much later. When your tires are worn down to 2/32" tread depth, you absolutely must change them. If you often drive in rain and snow, you'll need to maintain even more tread depth. How to test? Use a tire tread depth gauge - or failing that, a penny. Stick Abe Lincoln head-first into the groove. If part of his head is covered, you have more than 2/32" remaining. If not, head to a tire place immediately. Don't forget to rotate your tires about every 5,000 miles. Professional garages tend to rotate the tires in such a way that they wear evenly. 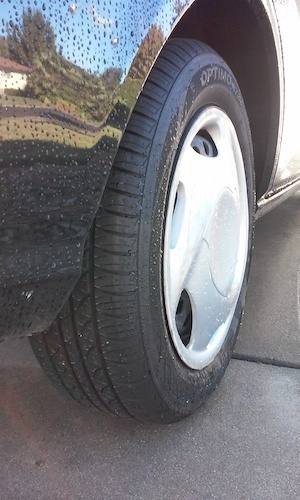 If your tires are wearing unevenly, you should ask about wheel balancing and alignment. Windshield wipers. This one is easier. Aim to replace wiper blades annually. But if you're noticing excessive streaking in the rain, replace them immediately, regardless of time. If you check your car manual for the proper blade length, you can buy and change the blades yourself. Or to make it even easier on yourself, just go into the auto parts store and use the book they provide next to the wiper blades. That little book will list the appropriate blade sizes for just about every conceivable year, make, and model of car. Wiper fluid. Another easy one. If you're shooting blanks, you're obviously out of fluid. But don't let it get to that point. 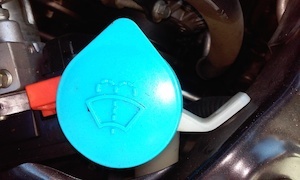 Check your fluid every couple months or so, and keep a bottle of wiper fluid in your garage. Refilling is as simple as unscrewing a cap and pouring. Don't take this issue lightly - a slightly cloudy windshield can suddenly become a major safety hazard when you're driving straight into a sunset. Oil and oil filter. Oil is one of the more controversial car maintenance topics. Some people insist you should change the oil and filter every 3,000 miles. Others claim this is unnecessary (and, in fact, wasteful) on newer cars, and put the change point at 5,000 miles. Whatever you decide, keep in mind that time is also a factor. Change your oil at least every six months, even if you haven't racked up enough miles. Also be aware that some synthetic oils are designed to be changed only every 5,000 miles. Air filter. Check your air filter as often as you change your oil. Most oil change shops will check the air filter and then offer to replace it for you - but you'll pay a bit more that way. 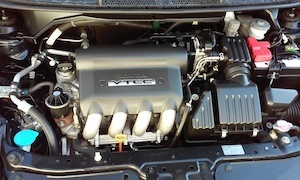 Checking and changing an air filter is among the easiest car maintenance tasks imaginable. You'll have to check your manual for exact instructions for your make and model, but trust me: if you can use a screwdriver, you can change an air filter. Automatic transmission fluid (ATF). Check your ATF every time you change the oil, or every few months. If you get your oil changed at a service center, the staff should check all fluids for you. If not, keep some ATF in your garage and replenish it regularly. Coolant. Your car needs coolant (antifreeze) to withstand extreme temperatures. Manage coolant the same way you manage ATF - and yes, the oil change guys should be checking this for you. Drive belt. The drive belt, or serpentine belt, typically comes out of the front of your engine and drives many important car accessories. Check your drive belt at every oil change. You'll want to look for cracks, fraying, separation, and even foreign objects (such as grit and gravel) stuck in the belt. This is one task that doesn't often appear on the typical person's car maintenance schedule - but it should. Feel free to print this page and use it as your car maintenance schedule. It doesn't cover everything, but it's a good start.